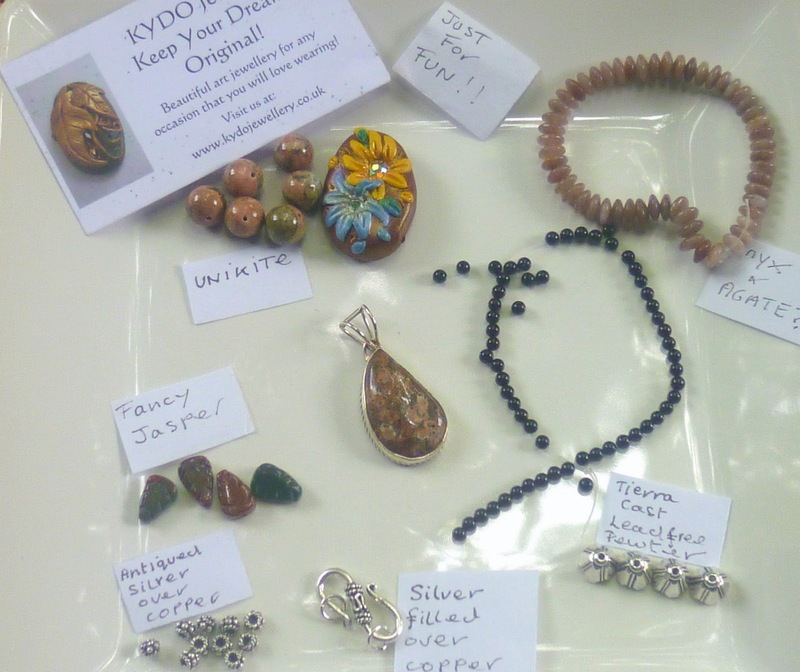 Nicki's Reef: Bead Soup Party Reveal Day !!!!! 57 Response to "Bead Soup Party Reveal Day !!!!!" Beautiful Nicki - and classic, just like you say. I'm totally with you on polymer by the way - i had a shot recently and it looked just like it did when I was playing with Fimo in the 80s as a wee girl!! 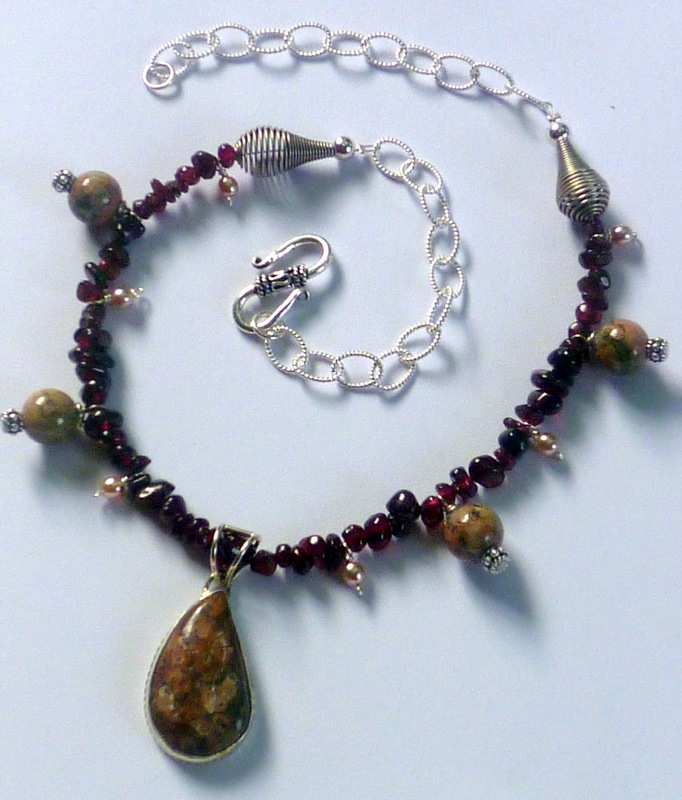 The garnets bring it all together really well, and are such a nice color! Oh Nicki, die ist ganz, ganz toll geworden! The garnets look so right with the stone focal pendant and the silver marries it all together. Very classic and beautiful. A good last minute "pull together"
this necklace is so cool! love the colors! Beautiful necklace! Love the colors and interesting design! Nice necklace. It is a good choice of colours for that focal. Hi Nicki, I think you did really well with the soup I sent you I love the necklace it will work with so many autumn and winter outfits. Belated birthday wishes to little Amelia. Eine wirklich schöne Herbstkette, perfekt zu derben braunen Stiefeln, finde ich! Hugs! Eine wunderschöne Kette - passt zu vielem, könnte man jeden Tag tragen. Gefällt mir sehr, sehr gut! Such a pretty piece! Great job! Wow, a gorgeous necklace, I really love this! Nicki you did a beautiful job! I felt challenged with the darker colors I had as well - This is beautiful and wearable - a lovely job! I love the black in your design! It is so pretty! What a lovely piece! What a beautiful elegant piece, I love it! Great Job! Nikki, as always, very nice! Oh you did a great job with that pendant! I'm sure it just glows because her choice of gemstones is always great. And I can't wait to see what you end up doing for a bracelet! Very elegant and pretty and I love the contrast of the bright silver and the dark garnet and earthy jasper. I love how you used the spirally beads to frame the piece. Very clever! I think it turned out lovely. I like the way you put everything together and the colors. Very nice. You did an awesome job with your soup! Lovely creations! I think you did a great job mixing the pendant with the necklace. I love jasper, such earth, you worked with it well. I was a last minute lady too!!! Your necklace is beautiful, the colors are some of my favorites. Wonderful! You have created a terrific piece of wearable art. I like your use of color and texture, and the focal pendant is so pretty. Thank you for sharing your artistic process along the way. Cheers! Beautiful and it does not look like it was put together at the last moment. I love it! You had such a lovely focal pendant to work with. 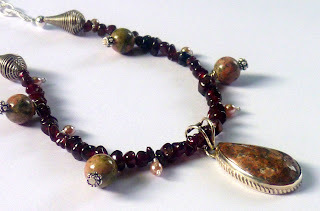 I think you were totally right to pair the focal with the garnets. They look stunning together! Can't wait to see what you do with the rest of it, if this is an indicator! Blessings! Beautiful classic design, I love the colour palette. Your necklace is gorgeous! I just love that pendant! The deeper garnet was an inspired choice with the focal. It says simple and elegant, just what you were striving for. I'm so glad you solved your dilemma just in time! It really is a pretty necklace, but I can see how that bit of pink would deter you. It would me too. You solved it elegantly! What a beautiful necklace and pendant! I love it with the garnet! That is one beautiful necklace you've made! Gorgeous! Classy, elegant, and beautiful! I love the mix of the dangles and the chips and they just look amazing with the focal! Bravo! Sometimes, simple stringing is the best choice for the beads you're using, and it was definitely the right choice here -and I can't wait to see what you make with the cool polymer bead! Garneto chips mathc perfectly the pendant and all the other gembeads. "I usually wire wrap everything", I could have written that! Lovely necklace! I like that there's a lot of texture in it that adds interest. Great job! 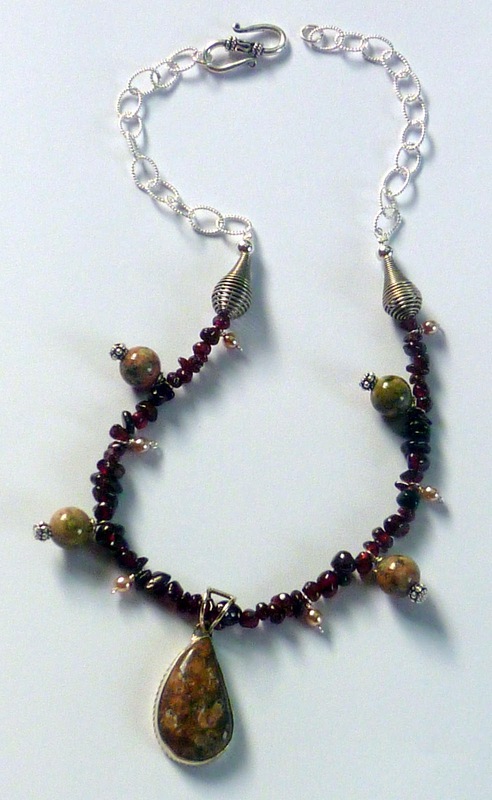 The garnets worked perfectly with the necklace - love it! Beautiful, Nicki!! You do amazing work under pressure - I know this must look so beautiful when worn too! Your idea was perfect; the necklace is lovely! Very nice creation, Love the wire thing-a-ma-bobs just before the chain!! calm colors too.